What they got was a human statue. For a moment. There was magic in that moment – and an important lesson for crowdfunders, too. Crowdfunding is a fascinating topic for anyone who is concerned with creating thriving online communities. The question is the same whether you are trying to launch an album, start a social movement, or build a wiki: how do you get people to contribute? For every high profile success story, there are a thousand forgotten failures. Drafting an invitation to contribute and slapping it up online is easy. Getting people to pitch in hard. Palmer’s advice is more subtle than it appears. It all comes down, she says, to learning how to ask. Ask with an open heart (and a cap in hand). Show humility – this is important. Genuinely expressing need makes us vulnerable. Embrace it. It takes courage let down one’s guard, but it can work in our favour. When people sense vulnerability, it affects them. Some people become haughty and disdainful and look the other way. Other people grasp that there is a human being before them and they feel drawn to connect with them. Let me tell you, if you want to experience the visceral feeling of trusting strangers, I recommend this, especially if those strangers are drunk German people. This was a ninja master-level fan connection, because what I was really saying here was: ‘I trust you this much. Should I? Show me’. Some bloggers have suggested that Palmer’s advice is platitudinous. Of course one needs to ask in order to receive. Surely Palmer is not just saying: ‘Ask nicely and good things will come to you?’ Not at all. Palmer’s point is that there is an art to asking – a performance art. Check out the video on Palmer’s Kickstarter page to get a taste of it: simple, heartfelt, and endearingly human. Now, there’s an insight that follows from this observation that Palmer doesn’t articulate in her talk, although it is implicit throughout. The art of asking involves a certain performance. And a performance, like all forms of art, is a gift. If you want to receive gifts from strangers, it is only right that you start by offering them a gift. So play for your peeps. Work a little magic. A winsome performance goes a long way. Think of how Palmer opens her talk with her evocation of the Eight Foot Bride. This performance puzzles, intrigues, and engages the audience. It adds something unexpected. It is a simple gift. Yet it is a supremely powerful device. The gift transforms social space. It says to people who are open to it: ‘Here’s an opportunity for us to experience something special. Here’s an opportunity for us to forge a connection’. 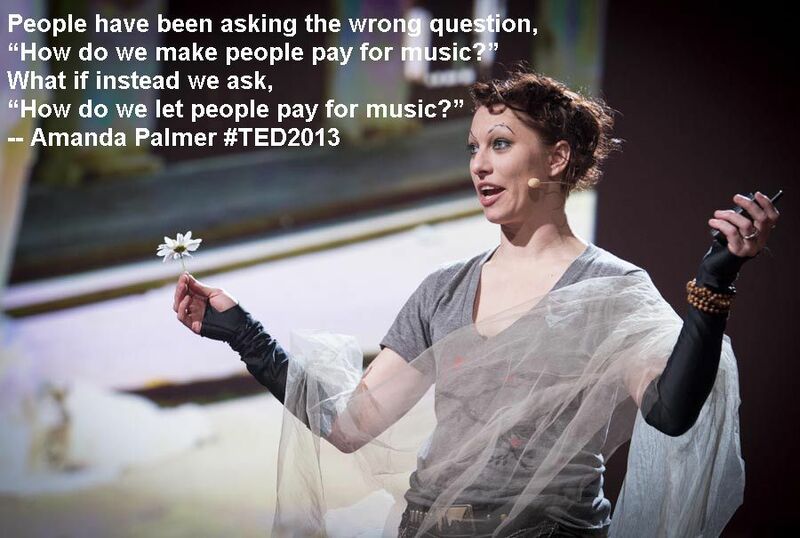 Years of performing as the Eight Foot Bride would have drilled this insight into Palmer’s DNA. 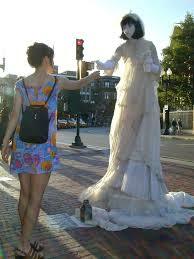 A human statue changes the social space of the street. When the performer is in motion, setting up her props and materials, she is just another oddball in the urban zoo. The moment that she freezes, everything changes. Not for everyone. Plenty of people keep on walking, frightened of what might happen if they pay attention, pretending that the performer isn’t there. For others – those who become the audience – the moment is an invitation and gift. The city street has changed. It is no longer a through way – it has become a magical space where a unique experience can take place. Can – not does. If the magic is to work, the performance requires the reciprocity of the crowd. I had the most profound encounters with people, especially lonely people who looked like they hadn’t talked to anyone in weeks, and we would get this beautiful moment of prolonged eye contact being allowed in a city street, and we would sort of fall in love a little bit. And my eyes would say, “Thank you. I see you.” And their eyes would say, “Nobody ever sees me. Thank you”. A human statue is in the business of making money. Obviously, as a mime, she can’t come out and ask for it. The ‘ask’ is in the art. The art involves (literally) stepping up in public and performing a set of gentle human gestures. For people on the street who are open to connection, this is an opportunity to enjoy a rare experience that removes them from the pace of the day. 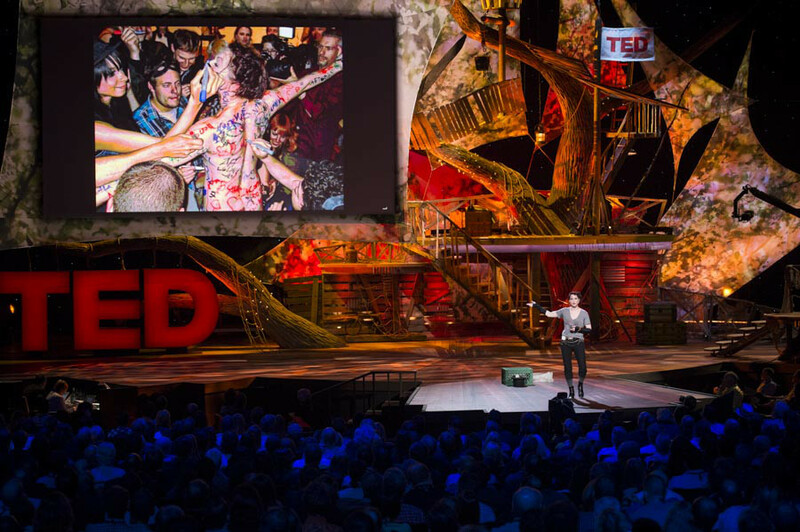 By stopping and attending to the performance, they create a shared space for magic to occur. They join in creating and holding the space. They enjoin in a moment of theatre. Theatre can be created in any place. It creates its own space so long as the audience is willing to participate in making it happen. Performers must initiate the process: this is essential. Theirs is the first gift. Be it a joke, a song, or a simple gesture, it is ultimately an invitation. It says to people: ‘here is an opportunity for us to experience something special together’. The gift implies an ask: ‘will you help me/us to create this space? Will you participate in making the magic happen?’ The audience returns the gift by affirming the invitation. A community is born to hold the space. A community that is emotionally invested in keeping the space open. Asking for money is never easy. Many people feel ashamed to hold out the hat. But there is no shame in trying to sustain a meaningful connection. When you create a meaningful connection, people want to help you sustain it. They recognise that you are offering them a social experience over and above whatever project or product you are trying to fund. They already feel invested in what you are trying to do. The crucial thing is to create a shared space where simple exchanges become meaningful gifts. Create a space and invite others to help hold and enjoy it. This fosters connection and trust and lays the soil for reciprocity to bloom.